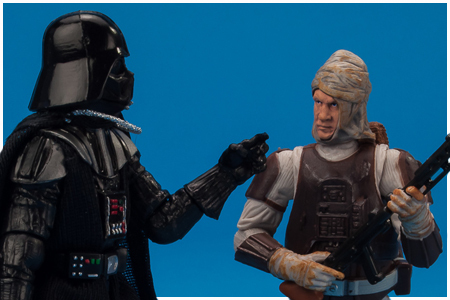 Despite the fact that the original 1980 Kenner figure wasn't all that remarkable, Hasbro opted to slot the 2010 version of Dengar as the first figure in The Vintage Collection. The VC01 Dengar figure was, to that point, the best figure they have ever crafted of the Corellian bounty hunter and featured a completely new sculpt. Hasbro revealed four of the figures in the first wave of The Vintage Collection at the UK Toy Fair in January 2010, but the first wave, which also included new figures based on Leia (Hoth Outfit), the first ever Han Solo (Echo Base Outfit), Luke Skywalker (Bespin Fatigues), the generic and very Kenner-esque AT-AT Commander, C-3PO (See-Threepio) with removable panels, the first ever single carded Dack Ralter, (Twin-pod) Cloud Car Pilot and Darth Vader along with repacked 4-LOM and Boba Fett figures; wasn't fully revealed until the International Toy Fair the following month. This assortment began showing up in July 2010. In the U.S. all eleven figures shipped with starburst stickers on the card front and pamphlets in the blister for a mail away Kenner style Boba Fett figure with a rocket-firing feature. In Canada, the initial release, which was found only at Walmart stores, didn't have the offer, so there were no stickers or pamphlets included. By the time the figures hit Toys "R" Us Canada, however, the offer was included. For whatever reason the stickers misspelled Fett's name as 'Bobba'. Card Back: There are two known variations on the back of the VC01 Dengar card. The first version had the Age Warning logo beside the Warning logo on left hand bottom portion of the card and had "COLLECT THESE AWESOME CHARACTERS! (Each sold separately.)" and "Original figures and packaging illustrated here are not available." printed mid card. The second version moved the Age Warning logo to the bottom between the Lion Mark and the Hyperspace logo and did away with the above mentioned text in favor of "Original figures in packaging from 1970's, 1980's, 1990's, and 2000's illustrated here are not available." There were two versions of the VC01 Dengar sold in Canada. The first, found only in the initial shipment to Walmart in July 2010 did not have the mail away offer, so the card didn't have a sticker of pamphlet. The second version, which was readily available did feature the offer, but the starburst sticker had a typo, so it promoted a special "Bobba Fett" figure offer.